Originally released as part of Bite the Neighbor, a hand-packaged 3" disc. This was recorded with processing through some of Harald Bode's vintage analog processors (Barber Pole Phaser, etc.) courtesy of Peer Bode. Recorded at the Institute for Electronic Arts (iea) at Alfred University. A soundtrack for a videotape by Seoungho Cho. Two edits from an unreleased CD by Stephen Vitiello in collaboration with Pauline Oliveros and Joe McPhee. Pauline is playing accordion. Joe is playing a pocket trumpet. Stephen is doing live processing, samples and final edits. A live duo recorded at the Burchfield Penny Art Center in Buffalo, NY. Tony had a bright light shining into a mirror. The mirror cast reflections on the wall which were caught by Stephen's hand-held photocell sensor, which translats light frequencies into sounds. These sounds were processed live as Conrad also responded by bowing the edge of the mirror with a violin bow. A live duo recorded at the Whitney Museum's Philip Morris space in mid-town Manhattan. Toné prepared samples of Stephen's work, while SV prepared samples of Toné. The result was a one-time, unrehearsed performance that will hopefully be repeated some day. A collaboration with Pauline Oliveros for a un-released compilation that was meant to be released by JDK Productions in Amsterdam to benefit Radio 100. An excerpt from a live concert at the Cariter Foundation, Paris as part of the Nomadic Nights series. The concert was programmed in conjunction with Unknown Quantity, curated by Paul Virilio. The audience for this concert stood under a sculpture by Nancy Rubins, consisting of suspended trashed and burned pieces of airplanes. A recording from the 91st floor of the World Trade Center, Tower One made with contact microphones placed on the inside of the windows. This recording was only published as part of a CDR sold at an Open House Exhibition in the fall of 1999. Various recordings were made during a 6-month residency. This one in particular picked up a number of passing planes and helicopters. These four tracks made up the original "Papercut Demo" that preceded the CD Light of Falling Cars (JDK Productions). The demo versions were without overdubs. When LOFC was released several friends lamented that they preferred the stripped down originals better. This is a stereo mix of a 13-speaker installation created for the Morrow Sound Cube, presented at The Kitchen in April of 2004. The piece combines an atmospheric track created with a photocell amplifying light sources onstage at the San Francisco Electronic Music Festival, mixed with an overdub of a wind storm pulling the roof off of an old shack in the Brazilian Amazon. This track should be LISTENED TO WITH HEADPHONES ONLY. The recording is a real-time document of a walk in the Brazilian Amazon, created for and commissioned by the Cartier Foundation for the exhibition "Yanomami: Spirit of the Forest". Small binaural (in-ear) microphones were used to capture the sound which makes playback on headphones a deeper 3-dimensional listening experience, while playback through speakers will sound thin and unbalanced. Two radio documentaries produced by Michael Raphael for National Public Radio broadcasts. Savy Traveler focuses on the 2003 trip to the Amazon and the installations created for the Cartier Foundation's exhibition "Yanomami: Spirit of the Forest." The second piece documents the World Trade Center Recordings as well as music tracks included on the CD Bright and Dusty Things (New Albion Records). A performance by Steve Roden and Stephen Vitiello at the Chinati Foundation, Marfa, TX from September 2007. Steve and Stephen were inside one of the large artillery sheds, filled with Donald Judd's sculptures and a 6-second reverb. The audience was outside, watching through the glass as the sun set. The live mix was done by Bob Bielecki, with support from engineer Gregory Smelley. 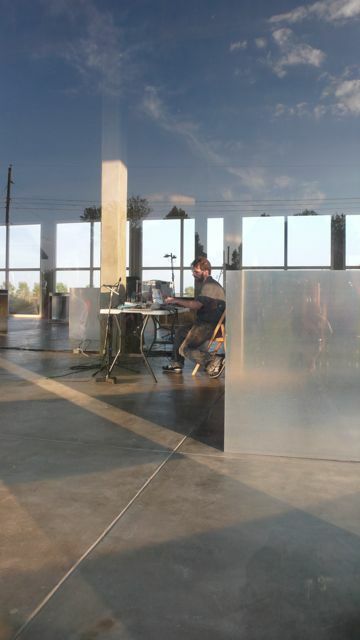 The performance was part of the Marfa Sessions, an exhibition organized by Marfa Ballroom, curated by Regine Basha, Rebecca Gates and Lucy Raven. A mashup of Bruce Nauman's "Get Out of my Mind, Get Out of This Room," mixed with Willow Smith's "I Whip My Hair." There's something about the rhythm of the Willow song that seem to call out to the Nauman. A remix of a Miley Cyrus song in an imagined collaboration between Miley and Steve Reich. Stephen Vitiello is an electronic musician and media artist. Since 1989 he has collaborated with numerous artists, including Tony Oursler, Scanner, Pauline Oliveros, Nam June Paik, Tetsu Inoue and many others. CD releases include Bright and Dusty Things (New Albion), Scanner/Vitiello (Audiosphere/Sub Rosa) and the forthcoming collaboration with guitarist David Tronzo, Scratchy Monsters, Laughing Ghosts (Elision Fields). Stephen's sound installations have been presented at the 2002 Whitney Biennial the Cartier Foundation, Paris in solo exhibitions at The Project, NY and Los Angeles. As a curator, he organized the Sound Art segment of 'The American Century: Art and Culture 1950 - 2000' for the Whitney Museum, and organized 'Young and Restless', a video program which toured to over 40 venues internationally, for the Museum of Modern Art in New York and the 2004 Kitchen Benefit featuring legendary composers including, Philip Glass, Steve Reich, Laurie Anderson and Meredith Monk. He was recently acknowledged as one of 25 "Movers and Shakers" in the art world by ARTnews Magazine.